A surprisingly impressive 10-12 mile loop at the northeast corner of Rocky Mountain National Park. Extremely unusual, impressive rock formations. Broad expanses of fields. We spotted a large herd of elk on our hike. We ended at a spot so far from our trail head parking lot (decided against the loop trail turn-off) that we were forced to hitch-hike back. The trail head parking lot is at an elevation of 7,920 feet. The total elevation gain is 2,100 feet. Despite the gain, this is a relatively easy hike. An easy, 4-mile roundtrip hike. Tends to be relatively crowded with hikers. Very scenic, wooded views of several creek and cascade runs. Much of the trail follows a roaring, rocky whitewater creek. Terminates at a wonderful waterfall. The trail starts at the Wild Basin trail head (8,500 feet in elevation) in Rocky Mountain National Park. Elevation gain is 950 feet. Round trip hiking length is about 4-5 miles. This trail is a long, relatively difficult trail with a seemingly endless uphill hike. Spectacular panoramic views, however, make the exertion worthwhile. Very little water is found along this trail, so be sure to carry sufficient water. An abundance of tundra is found along the trail. 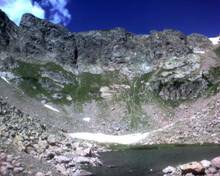 The trail starts at the Bear Lake trail head (9,475 feet in elevation) in Rocky Mountain National Park. Elevation gain is 2,849 feet. Round trip hiking length is about 9 miles. When we arrive at the Flattop summit, Hallett Peak, at 12,713 feet, looms in front of us across a large canyon. The Peak is only 1.6 miles from the Flattop summit, and it is BEGGING me to summit it. On August 6, 2011, on a clear day, I do just that. There are rewarding views in all directions. A bit of a shock for me, however, as only a week ago, I was in Gainesville FL, where the August temperatures were steamy hot (very, very humid and over 100 degrees). As we ascend Hallett, by stark contrast, the stiff wind and over 12,000 feet of elevation make my hands go numb. I don a raincoat to stay warm. Even in Boulder on this August day, the temperature we had left to do this hike was over 90 degrees. We did these trails on back-to-back days by overnight camping along South Boulder Creek near the trail heads. Superb lakes and wildflowers (when in season). Terminate very close to the continental divide. Both trails have very long, steep uphill climbs (particularly to Crater Lake). 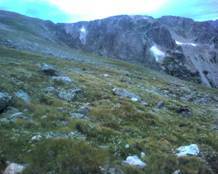 Trails start near the Heart Lake/Moffat Tunnel/East Portal trail head at the southern side of Indian Peaks Wilderness. These trails start at about 9,200 feet in elevation and have an elevation gain of about 1,400 to 1,600 feet. Round trip hiking length is about 8 miles for Forest Lake and 6 miles for Crater Lakes. We found this to be an easy, level bicycle ride (level due to the fact that it was formerly a railroad bed – The Switzerland Trail Railway). I had originally bicycled this trail in the summer of 1992, and enjoyed it enough to want to ride it again. The lack of elevation gain makes this a nice place for cross-country skiing. Panoramic vistas and spectacular fall colors are found along this trail. Often, trees and shrubs on the trail form a canopy tunnel along trail sections. 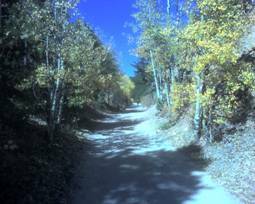 On the day we bicycled the trail, we enjoyed gorgeous, brilliant yellow fall colors of the aspen trees. This trail is adjacent to the burn zone of the most costly fire in Colorado history that occurred just a few weeks before our ride. We drove thru the burn zone near the small, charming town of Gold Hill (miraculously spared from the fire), and the former pine forest and residential areas now look like a lunar landscape. Utter devastation. But many homes were somehow untouched. Many "Thank you, firefighters!!!" signs placed on the road. Last time I biked this trail was July 1992. Total mileage of this trail is 14 miles. The trail is at an elevation of 8,400 feet. Another relatively easy trail hike providing stunning fall colors and panoramic views of the valleys. Indeed, this trail is so scenic that it was the venue of the movie “Stagecoach.” The colors and scene is rather pastoral, and reminded me of rural Vermont or New Hampshire. A mine is found along the way, and I noticed at the mine entrance that extremely cold air was emerging from the mine. 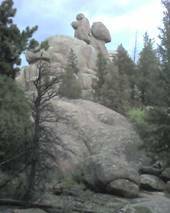 The trail is located between Nederland and the Indian Peaks Wilderness and is part of the Boulder County park system. 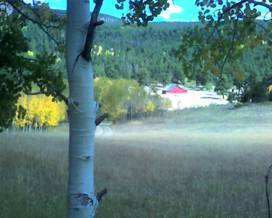 In 1971, music producer James Guercio purchased the ranch and renamed it Caribou Ranch. He converted a barn into a recording studio, attracting Chicago, Elton John, Rod Stewart and others. The recording studio closed after a fire in 1985. The ranch was cooperatively purchased by Boulder County and the City of Boulder from Mr. Guercio beginning in December 1996. Caribou Ranch consists of 2,180 acres of backcountry. An additional 1,489 acres are protected through an adjacent county conservation easement. The current trail system is 4.5 miles round trip from the main parking lot. It consists of the DeLonde and Blue Birds Loop trails. 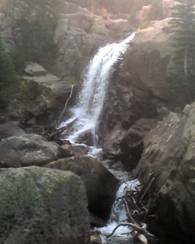 Alberta Falls is an extremely easy yet rewarding hike with excellent mountain and valley views within Rocky Mountain National Park. While there, we had multiple, extremely close encounters with a family of large elk. So close that we could smell them. The falls – fed by Glacier Creek -- are impressive, and serve as an excellent venue for lunch. The trail head is at Glacier Gorge, which is at an elevation of 9,200 feet. Total elevation gain for this hike is 272 feet. Round trip hiking distance for the trail is about 4 miles. 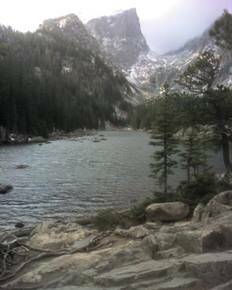 This loop hike in Rocky Mountain National Park features several extremely picturesque mountain lakes. It is an easy beginner trail that sees fairly heavy use by hikers. During our early October hike, the park started receiving its first measurable snowfall of the season. 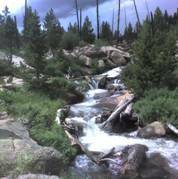 The Bear Lake trail head is relatively high at 9,475 feet in elevation. Elevation gain for this loop, which returned us to Glacier Gorge trail head via Alberta Falls, is 750 feet. The mileage for this loop is 8.4 miles. This loop mountain bike ride consists of a tough, long climb along a single track filled with lots of relatively large, sharp rocks, making for a rather technical, yet doable ride. The total loop distance is approximately 9 miles and requires about 2.5 to 3 hours of riding. 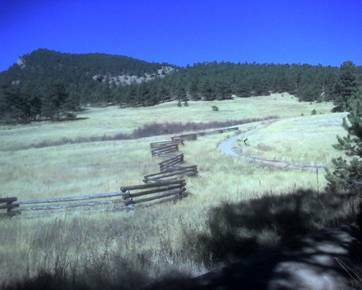 Heil Valley Ranch is just over 5,000 acres in size and is part of the North Boulder Foothills Open Space system, and was acquired by Boulder County in 1993. The property is filled with wildlife. On the gorgeous fall day we rode it, we had multiple encounters with flocks of quite large wild turkeys. The mid-point of the loop takes riders to a breathtaking valley view with peaks beyond the valley. The second half of the loop is an exhilarating yet technical downhill ride along the western leg of the Ponderosa Trail (we started on the eastern leg of the Wild Turkey Trail). For both the uphill and downhill portions of the loop, great skill is required by the bicyclist in picking a line that allows one to successfully negotiate the rock-filled trail.